“I feel like I’m on a personal race against the onset of Alzheimer’s,” says Sigrid, one of the characters in Will I Be Next? Sigrid’s on a mission to stay ahead of the disease through healthy eating and exercise. As a participant in the Wisconsin Registry for Alzheimer’s Prevention research study, she is aware that early findings show that lifestyle changes may have an impact on her risk for Alzheimer’s disease. A study linking brain health and physical activity is detailed in the June 2017 edition of the Journal of Alzheimer’s Disease. The study observed that moderate physical activity was associated with healthier levels of glucose metabolism in the brain—a measure of brain activity. One of the goals of the Will I Be Next? community impact plan is to activate a culture of brain health. 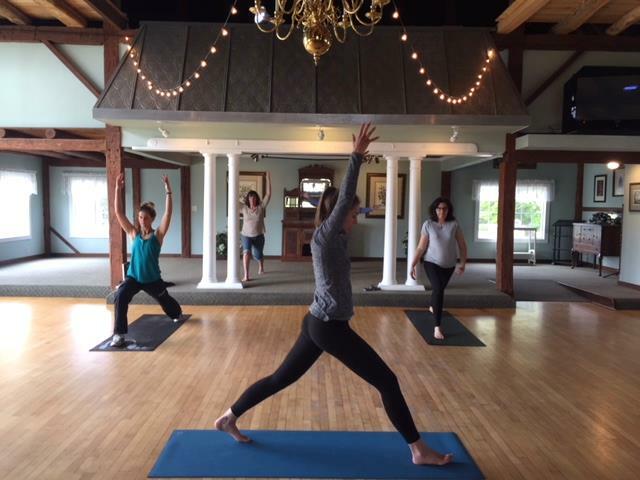 Fitness specialist Kaitlyn Schoofs and certified yoga instructor Alex Reichenberger donated their talents to lead multiple group sessions at a recent fundraiser to support production of the documentary. Film supporters gathered at Homestead Meadows—Greenville, Wisconsin—for the fundraiser to support production costs for the documentary film. The event included yoga and Zumba exercise sessions, a short preview clip from Will I Be Next?, and personal reflection. The venue, owned by the Steve Nagy family, was offered as a gesture of support for efforts to search for the cure for Alzheimer’s. The Nagy’s connection includes Arlene’s mother who lived into her 90s, with the last 15 years clouded by slowly advancing Alzheimer’s. The event helped participants re-energize while focusing on strides in Alzheimer’s research.